With the International Olympic Committee’s (IOC) decision on snowboarding slopestyle being included in the 2014 Winter Olympic games just around the corner, one of snowboarding’s all-time legends Terje Haakonsen has applied more pressure for the recognition snowboarding’s participation in the process by creating an OLYMPIC SNOWBOARDING CHARTER.The charter was signed by most of the top slopestyle riders in the world this week as they gathered for Terje’s own 6-star TTR World Tour event – THE ARCTIC CHALLENGE, considered one the top slopestyle events on the yearly calendar. Rumour has it that a delegation of IOC members will be in attendance at this weekend’s event to watch proceedings aftre Terje personally invited them in an effort for the IOC to see what top level slopestyle events actually look and run like. Snowboarders around the globe hold their breath and hope that the IOC will make a level headed informed decision unlike the debacle of the inclusion of snowboarding halfpipe into the Winter Olympic Games back in 1998. Top female snowboarder in slopestyle and halfpipe Kjersti Buaas, who has also represented her country Norway twice at the Winter Olympics, stands with Terje Haakonsen displaying the signed Olympic Snowboarding Charter that urges the IOC to recognise top level snowboarding and snowboarders. This coming April 2011, the International Olympic Committee (IOC) will decide whether they will introduce the slopestyle discipline into the Olympic Games program or not. 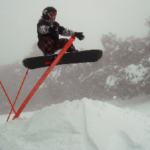 Snowboarders from around the world support the inclusion of slopestyle, but only if the sport is run by snowboarders. With all the best slopestyle riders competing in Oslo, Norway this week at the highly regarded Arctic Challenge, the “Snowboarding 180 Olympic Charter” was announced which aims to influence the IOC decision. Snowboarding is no longer the kid brother in the Olympic Winter Games. With over 30 million Americans watching the Vancouver halfpipe finals, snowboarding has a strong presence in the Olympic landscape. In the 180 Charter, the best snowboarders in the world recognize the Olympics as the potential pinnacle event of the sport, but only on certain conditions. They want their voices to be heard in an open and democratic decision making system, and they want a new order for qualifying to the Olympics. Currently, the International Ski Federation (FIS) is running the Olympic qualifications. 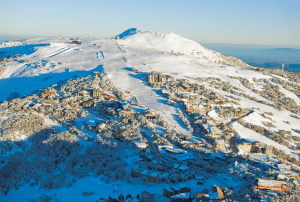 The ski federation does not currently do a world slopestyle tour but has announced that they will establish this if the discipline is accepted into the Olympic program. According to the 180 Olympic Charter, this will lead to conflicting event dates for the riders since there are existing slopestyle tours with established and progressive events. The snowboarders ask the IOC to make a 180 turn: Conflicting dates will hurt the progression of the sport. They want a common Olympic ranking for all world-class events, not only for FIS-events. 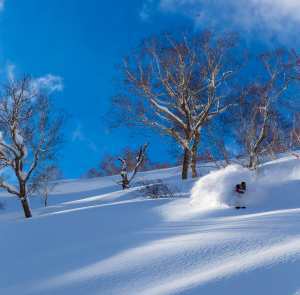 Snowboarding should be run by snowboarders. We recognize the Olympics as a potential pinnacle event of snowboarding, but only if our voices are heard. All snowboard events and organizations throughout the world must listen to the driving force of our sport: the athletes. Snowboarders want a transparent and democratic process in all decision-making systems that have an effect on our daily lives and occupation. 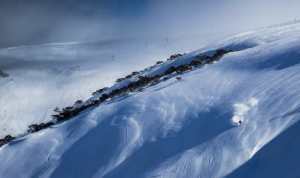 Snowboarding will never reach its full potential with conflicting dates of major snowboarding events. We do not want a new world tour for slopestyle qualifications. We want an Olympic ranking to reduce the date conflicts of major events. We believe the International Olympic Committee has a responsibility to listen to our voices and make way for the unleashing of snowboarding’s true potential. We want all powers to start a dialogue to find a solution for the better good of the sport. 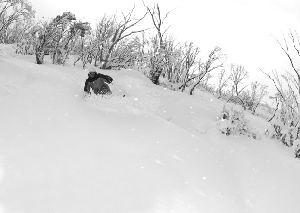 Preserving the status quo in snowboarding is not an option. 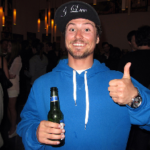 Ryan Tiene – holding it together with all thumbs up and looking stoked for the premiere. In reality he was shitting bricks and nervous as hell.